Cat in the Crochet Hat Pattern: Dr. Seuss Inspired! Hello, everyone! Did you guys know that I have a degree in English Literature? Basically, I read a lot and I’m obsessed with books :D. Yesterday was actually Read Across America Day in honor of Dr. Seuss’s birthday and it just brought me back to when I was in 2nd grade. I remember being in our school library, sitting in a circle on the floor while our librarian (who was amazing) read to us. Those memories of that little room full of books are some of my favorite memories and I wanted to celebrate this holiday. I wanted to do something a little fun and weird and wacky like Dr. Seuss, so I made a crochet hat after the one in the Cat in the Hat. It’s super easy to make and it would just be something fun for a kid and maybe something to wear on Crazy Hat Day! This hat is worked up pretty quickly and it doesn’t involve anything too difficult so it’s perfect for beginners. The main stitches used in this crochet hat pattern are double crochets (DCs) and half double crochets (HDC), both of which I have tutorials for if you need them. It’s also worked in the round and uses a magic loop to start. You can find video tutorials for all these things on my Youtube channel! 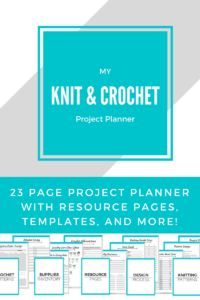 Get all my basic crochet tutorials and 15 beginner-friendly patterns for free in The Beginner’s Guide to Crochet when you subscribe! 1. With red yarn, create magic loop, chain 1 and work 8 HDCs into the loop. Pull the loop closed and slip stitch to the chain 1 to finish the round (8 stitches). 2. Chain 2. Increase in each space by working 2 DCs into each space. Slip stitch to the top of the chain 2 to finish (16). 3. Chain 2. *DC 1, increase*, repeat around and slip stitch to the top of the chain 2 to finish the round (24). 4. Chain 2. *DC 2, increase*, repeat around and slip stitch to the top of the chain 2 to finish the round (32). 5. Chain 2. *DC 3, increase*, repeat around and slip stitch to the top of the chain 2 to finish the round (40). 6. Chain 2. *DC 4, increase*, repeat around and slip stitch to the top of the chain 2 to finish the round (48). 7. Chain 2. *DC 5, increase*, repeat around and slip stitch to the top of the chain 2 to finish the round (56). 8. Chain 2. *DC 6, increase*, repeat around and slip stitch to the top of the chain 2 to finish the round (64). 9. Working into the back loops only, chain 1, HDC around and slip stitch to the chain 1 to finish (64). 10-13. Chain 2, DC around and slip stitch to the top of the chain 2. Continue this for 4 rounds (64). 14-17. Chain 2, DC around and slip stitch to the top of the chain 2. Continue this for 4 rounds (64). Switch to red yarn. Continue working in this pattern until you have two white stripes and 3 red stripes, each of 5 DC rows. 1. Attach white yarn and chain 1. Working in front loops only and the top loop of each DC, HDC around. You want to insert your hook through the loop you see at the very top of your DC, as well as the front loop of your normal stitch so that you turn the brim out instead of working down. 2. Chain 1. *DC 2, increase* all the way around, DC into the last space (85). 3. Chain 1. *DC 3, increase* all the way around, DC into the last space (106). 4. Chain 1, HDC around. Bind off. Weave in all the loose ends and trim any excess yarn. 1. First, use red yarn and repeat steps 1-7 of the hat to create another circle, one that’s a little bit smaller than the top of your crochet hat. Bind off, but leave a long tail for sewing. 2. Add your Polyfill to the hat. Fluff it up and fill only until the end of the second red stripe. You don’t want to pack it in and make it firm, you just want to fill the space enough the the hat doesn’t cave in on itself at the top. 3. Then, place your circle inside the hat, at the end of the second red stripe where the stuffing is, and sew it around the inside of the crochet hat. This will be a barrier to keep all the stuffing inside and out of your hair. Once that’s done, just fasten off the yarn and weave in the end, and trim any excess yarn. If you liked this, don’t forget to subscribe down below to get weekly newsletters full of updates and new posts! 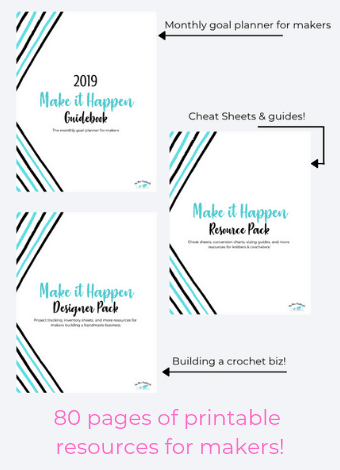 You’ll also get access to the resource library where you can download subscriber-only freebies and guides, including The Beginner’s Guide to Crochet and the Ultimate Hat Sizing Guide! Just fill out the box below and you’ll get a confirmation email with all the details on how to get your freebies. Could you please clarify rounds 3 thru 8. It doesn’t indicate if I DC in the first stitch, every other stitch, or put that many stitches in each stich. You work 1 DC in as many stitches as indicated, and where it says “increase” you work 2 DC into the same stitch.